Capitalism: A Love Story is a 2009 American documentary film directed, written by, and starring Michael Moore. The film centers on the late-2000s financial crisis and the recovery stimulus, while putting forward an indictment of the current economic order in the United States and unfettered capitalism in general. Topics covered include Wall Street's "casino mentality", for-profit prisons, Goldman Sachs' influence in Washington, D.C., the poverty-level wages of many workers, the large wave of home foreclosures, corporate-owned life insurance, and the consequences of "runaway greed". The film also features a religious component where Moore examines whether or not capitalism is a sin and whether Jesus would be a capitalist, in order to shine light on the ideological contradictions among evangelical conservatives who support free market ideals. The film was widely released to the public in the United States and Canada on October 2, 2009. Reviews were generally positive. It was released on DVD and Blu-ray on March 9, 2010. Moore begins by looking back at the contradictions in Ancient Rome, drawing similarities with the present day, and wondering how people of the future will look back on American society now. Would they pay more attention to viral videos or the wave of home foreclosures after the late-2000s financial crisis? Moore meets with his friend Wallace Shawn and they discuss what capitalism and "free enterprise" mean. Looking back on his happy and prosperous early life, Moore reflects, "if this was capitalism, I loved it... and so did everyone else": in the 1950s, the top tax rate was 90% and this meant that the country could build dams, bridges, schools and hospitals, most families only had one parent in work, union families had free healthcare, college tuition was free, most people had little personal debt and pensions were guaranteed. This prosperity was driven by the manufacturing industry, which benefited from post-war Germany and Japan struggling to recover. He describes President Jimmy Carter's Crisis of Confidence speech as a turning point, which culminated in the election of Ronald Reagan in 1980, whom Moore calls a "spokesmodel" for the banks and corporations, who wanted to remake America to serve their interests. He points to the influence of Donald Regan, the Chairman and CEO of Merrill Lynch who served as Reagan's Secretary of the Treasury (1981–1985) and White House Chief of Staff (1985–1987), and the dismantling of America's industrial infrastructure, which was done for short-term gain by companies posting massive profits, and to destroy the unions. Unemployment and productivity increased as wages stagnated, the top tax rate was halved, household debt increased to almost 100% of GDP, bankruptcies and the incarceration rate skyrocketed and sales of anti-depressants and healthcare costs rose. This is compared to an increase in the Dow Jones Industrial Average and the ratio of CEO pay compared to the pay of average workers. Moore looks back on his first film, Roger & Me, about the regional economic impact of General Motors CEO Roger Smith's decision to close several auto plants in his hometown of Flint, Michigan, despite large profits. Moore tries to go into the General Motors head office in Detroit to speak to the Chairman but is denied access. He notes that by the time of the job cuts in Flint, Germany and Japan had rebuilt their automotive industries and were producing better, safer, cleaner, more reliable cars. Moore returns to the present, showing President George W. Bush enjoying his final year in office as companies announce massive layoffs and the economy starts to collapse. He also examines the Kids for cash scandal in Wilkes-Barre, Pennsylvania, which saw judges bribed by the builder of two private, for-profit juvenile detention centers, in return for contracting with the facilities and imposing harsh sentences on juveniles brought before their courts to increase the number of residents in the centers. After seeing the Congressional testimony of pilot Chesley "Sully" Sullenberger, who reported that over his career, his salary had been cut by 40 percent and his pension, like most airline pensions, was terminated and replaced by a "PBGC" guarantee worth only pennies on the dollar, Moore interviews other airline pilots on their experiences. They corroborate this, reporting low pay, massive debt, being on food stamps and taking second jobs. Moore notes that pilots being overworked and underpaid didn't enter into the media discussion following the crash of Colgan Air Flight 3407. He says that capitalism allows people to get away with anything, including making a profit from someone's death. He speaks to the family of a man who worked for Amegy Bank of Texas, which had secretly taken out a life insurance policy on him, with itself as the beneficiary, and then accidentally wrote to his widow, telling her that they were receiving a $1.5m payout because he died of cancer. He wonders how this can be legal when he is prohibited from taking out home insurance on someone else's property. Moore speaks to Catholic priests and Bishop Thomas Gumbleton, who agree that capitalism is evil and contrary to the teachings of Jesus and the Bible. Moore examines the claim that the tenets of capitalism are compatible with Christianity, arguing that the rich ignore religion when it comes to the poor, sick and disadvantaged. He points to Citigroup's leaked "plutonomy memo", which said that America and other countries were not democracies any more, but were ruled by the wealthy; though it feared a backlash from the "99%", who still had equal votes, but were content with the arrangement as they aspired to join the 1%. Moore then goes to see the United States Constitution, where he can find no trace of support for capitalism, only passages like "we the people", "a more perfect union" and "promoting the general welfare". He wonders what America would be like if all workplaces were democracies, like the worker owner co-operatives Isthmus Engineering & Manufacturing and Alvarado Street Bakery, where he finds that the workers are happy, concerned about fairness, productive and in the latter case, earn over $65,000 working on the assembly line. Moore also points to Jonas Salk, who developed and refused to patent a polio vaccine. He notes that now, top college graduates are so burdened with debt that they seek out high-paying jobs, leading many of them to work in derivatives and credit default swaps. Moore struggles to understand these concepts, finding that they are purposely complicated so as to avoid proper regulation. Cutting financial regulations also allowed for increased refinancing to access home equity, which meant that lenders like Countrywide Financial, Citibank, Wells Fargo and Chase Bank offered subprime mortgages to people who couldn't afford the increasing interest rates and defaulted, causing the subprime mortgage crisis, which led to the global financial crisis. Moore meets with an ex-Countrywide employee, whose job it was to give prominent politicians, regulators and financiers cheap mortgages and discounted loans. He then meets William K. Black, who was a central figure in exposing Congressional corruption during the Savings and loan crisis, who tells Moore that the FBI was investigating mortgage fraud but had its priorities changed after the September 11 attacks, leading to white-collar crime going unpunished. Black compares the financial crisis to the failure of a dam: slowly at first, with a little failure that stretches back years, that ultimately ends in a sudden catastrophe. He also reports that bank executives and former politicians and regulators, like Robert Rubin, Lawrence Summers and Timothy Geithner, were the ones who profited financially from this, after changes in the law that allowed commercial banks to get into investment banking, hence the merger of Citicorp and Travelers Group. Moore meets with several members of Congress, who report being told that they needed to vote for the $700 billion bailout of the banks or the economy would collapse. He notes that the Treasury Department, which negotiated the bailout with Congress, is full of former Goldman Sachs executives, as it was under President Bill Clinton, including Treasury Secretary Henry Paulson, the former CEO of Goldman Sachs. Moore reports that these former Goldman executives used the bailout money to rescue Goldman and other favored companies. After Congress rejected the bailout on September 29, 2008, pressure was applied. There was another vote on October 3 and the bailout passed. Moore asks Elizabeth Warren, Chair of the Congressional Oversight Panel, what happened to the money and she tells him that the Treasury Department and the banks followed a "don't ask, don't tell" policy. Moore calls Paulson's office to ask why he followed this policy but is hung up on by his secretary. So he drives to Wall Street in an armored car to attempt to ask the banks for the money back and perform citizen's arrests on the executives. Moore reports on the Occupy movement and the 2008 presidential campaign of Democratic Senator Barack Obama, who is demonised as a "socialist". He notes that the smears against Obama don't work, as support for him increases and people become curious as to what socialism actually means. He profiles Wayne County Sheriff Warren Evans, who orders an end to foreclosures; the Miami Low Income Families Fighting Together, who re-occupy foreclosed homes; and workers at Republic Windows and Doors, who organised a sit-down strike after being fired without severance, vacation time, or health care benefits after the company was taken over by Bank of America and JPMorgan Chase. The striking workers are met with support from Obama, clergy and Illinois politicians and Moore asks if this is the beginning of a worker's revolt. After six days, Bank of America agrees to all their demands. Moore compares this action with the Flint sit-down strike of 1936–1937 and recalls President Franklin D. Roosevelt's proposed Second Bill of Rights during his 1944 State of the Union address and lamenting that Roosevelt's early death meant that none of it was accomplished. However, as Roosevelt's advisors went abroad after the end of World War II, many other countries adopted his ideas. In contrast, Moore muses, ordinary American people eventually suffered from crises like Hurricane Katrina, while the rich are unaffected. The film ends with Moore marking Wall Street off as a crime scene, narrating that American people live in the richest country on Earth and deserve a decent job, healthcare, a good education and a home of their own, saying that it's a crime that they don't have these things, and never will as long as the evil of capitalism continues to enrich the few at the expense of the many. He calls for it to be eliminated and replaced with something good for all people—democracy. Moore concludes that he can't do this alone and appeals for help from the viewer. He quotes Don Reagan to Ronald Reagan, "... And please, speed it up". During the Cannes Film Festival in 2008, Overture Films and Paramount Vantage announced an upcoming project by director Michael Moore, though at the time they were vague about the project's theme. Originally thought to be a follow-up to the 2004 film Fahrenheit 9/11, it was revealed that Moore's film was to be a documentary about the financial crisis of 2007–2010. In February 2009, he issued an appeal to people who worked for Wall Street or in the financial industry to share firsthand information, requesting, "Be a hero and help me expose the biggest swindle in American history." Prior to the film's release, Moore partnered with web development company Concentric Sky to develop a companion website for the film. Footage of President Franklin D. Roosevelt detailing his proposed Second Bill of Rights was believed to be lost. Roosevelt, who had recently recovered from the flu, presented his January 1944 State of the Union address to the public on radio, as a fireside chat from the White House. He asked that newsreel cameras film the last portion of the address, concerning the Second Bill of Rights. This footage was believed lost until it was uncovered in 2008 in South Carolina by Michael Moore while researching for the film. The footage shows Roosevelt's Second Bill of Rights address in its entirety, as well as a shot of the eight rights printed on a sheet of paper. Capitalism: A Love Story premiered at the 66th Venice International Film Festival on September 6, 2009. The film also screened at the Toronto International Film Festival on September 13 and at the New York Film Festival on September 21. On September 23, the film had a limited release at two theaters in New York City and two theaters in Los Angeles, grossing $37,832 in its first day for a $9,458 per theater average. The theater average was considered strong, though it did not beat the record opening of Moore's Fahrenheit 9/11, which grossed $83,922 at two theaters in one day. Over the weekend of September 25, Capitalism grossed $231,964 in the four theaters. The film had a wide release in 995 theaters in the United States and Canada on October 2, 2009, about a year after the enacting of the Emergency Economic Stabilization Act of 2008, which approved a $700 billion bailout of Wall Street. The film opened in eighth place at the box office on the first weekend of its wide release, grossing $4,447,378. The final domestic total was $14,363,397, making it the 16th highest grossing documentary in history (2014). The review aggregate website Rotten Tomatoes reported that 75% out of 181 critics gave the film a positive review, with an average score of 6.7 out of 10. Similar website Metacritic, which assigns a weighted average rating out of 100 to mainstream critics' reviews, reported an average score of 61 out of 100 based on 35 reviews, indicating "generally favorable reviews". Deborah Young, writing for the trade paper The Hollywood Reporter, wrote of Capitalism: A Love Story, "Although it's less focused than Sicko or Fahrenheit 9/11... because its subject is more abstract, this is a typical Moore oeuvre: funny, often over the top and of dubious documentation, but with strongly made points that leave viewers much to ponder and debate after they walk out of the theater." Young acknowledged Moore's simplification of the topic and added, "But here his talent is evident in creating two hours of engrossing cinema by contrasting a fast-moving montage of '50s archive images extolling free enterprise with the economic disaster of the present." The critic noted whom the documentary targeted: "Though it blames all political parties, including the Democrats, for caving in with the bailout, the film is careful to spare President Barack Obama, who remains a symbol of hope for justice." Leslie Felperin of the trade paper Variety wrote, "Pic's target is less capitalism qua capitalism than the banking industry, which Moore skewers ruthlessly, explaining last year's economic meltdown in terms a sixth-grader could understand. That said, there's still plenty here to annoy right-wingers, as well as those who, however much they agree with Moore's politics, just can't stomach his oversimplification, on-the-nose sentimentality and goofball japery." Felperin said that the documentary was similarly structured to Moore's previous documentaries, "Capitalism skips around considerably, laying down a mix of reportage, interviews and polemic." Felperin observed Moore's prominent role in his own documentary, believing it to be justified with relevance to crises in the automobile industry that Moore's family personally encountered. The critic complained that Moore strove "to manipulate viewers' emotions with shots of crying children and tearjerking musical choices", believing that the documentary worked better when the director let the topic unfold through various accounts. The film is brilliantly researched, both with regard to the labyrinthine web of connections between the world of finance and the corridors of power and the wittily used archive footage. Interviews with Senate insiders and financial experts are informative, and there’s an amusing sequence in which he quizzes a selection of priests and bishops who opine that capitalism is "evil" and was not, in fact, the preferred economic model of Our Lord. Then Moore goes and spoils it all by hauling out his trusty bullhorn for a series of lame stunts. Like the complacent clown prince of agitprop, Moore hectors Wall Street doormen and security guards, while the company bosses remain in their fortress made of money, blissfully unaware of the fat man making a scene on the street far below....But for all his cheap tactics, Moore mounts a persuasive case that something is rotten in the current economic system. Three months after a scene in which Moore approaches Goldman Sachs headquarters to reclaim taxpayers' funds, the bank was one of the ten that repaid part of the $68 billion received from the Troubled Asset Relief Program. Moore responded to the action: "We're not talking about the majority of people who took the money ... not even 10 percent of the $700 billion has been returned." Moore criticizes Wal-Mart for "dead peasant" policies, all 350,000 of which were cancelled in 2000. However, Moore notes that the termination of the policies was covered in the presentation of facts and quotes in the closing credits. The documentary criticizes Senator Christopher Dodd and other government officials for benefiting from exclusive financial programs; Moore lambasts Dodd in particular for predatory lending as chairman of the Senate Banking Committee. The AP reported that the interest rates and fees involved were norms for the industry, and that the Senate's Select Committee on Ethics cleared Dodd and Kent Conrad of getting special treatments, but it cautioned the senators to exercise "more vigilance" with such deals. The Association of Advanced Life Underwriting issued a statement that Moore "mischaracterized" Corporate Owned Life Insurance (COLI), stating that the issues were addressed by Congress in the 1990s and again in 2006. The AALU further states that corporate-owned life insurance is taken out only on highly compensated employees, only with their knowledge and consent and that COLI finances employee benefits and protects jobs and that employees pay nothing for COLI but receive substantial benefits. Upon the film's February 2010 theatrical release in the United Kingdom, film critic Mark Kermode, appearing on The Culture Show, asked the BBC's business editor Robert Peston whether Moore's "crusading" had been based on a misrepresentation of American capitalism. Canada's Centre for Research on Globalisation characterized the response: "Peston cannot fault the facts of the movie, though he appears a little uncomfortable having to say so." Religion expert Anthony Stevens-Arroyo stated that the film should be considered "a special kind of Catholic achievement" and asked whether Michael Moore should be named "Catholic of the Year" for raising the serious issues in the context of Catholic social teaching, and for presenting "Catholic currents of social justice" in the film. At the Venice Film Festival, Moore won the "Leoncino d'Oro" ("Little Golden Lion") award for his documentary, and he also received the festival's Open Prize. The documentary was also nominated for the festival's Golden Lion award, but lost to Lebanon. Moore also received a nomination for Best Documentary Screenplay from the Writers Guild of America. ^ "CAPITALISM: A LOVE STORY (12A)". British Board of Film Classification. October 13, 2009. Retrieved October 30, 2015. ^ a b c "Capitalism: A Love Story (2009)". Box Office Mojo. Retrieved December 29, 2010. ^ Huffington, Arianna (September 21, 2009). "Barack Obama Must See Michael Moore's New Movie (and So Must You)!". The Huffington Post. Retrieved May 3, 2010. ^ Moore, Michael (October 4, 2009). "For Those of You on Your Way to Church This Morning ..." The Huffington Post. Retrieved May 3, 2010. ^ US Airways Flight 1549 Accident, Hearing. February 24, 2009. U.S. House, Subcommittee on Aviation, Committee on Transportation and Infrastructure. Washington: Government Printing Office, 2009. ^ a b Dave McNary (July 8, 2009). "Michael Moore unveils title of new doc". Variety. Retrieved September 22, 2009. ^ "Web firm lands big contract". The Register-Guard. October 10, 2009. ^ "The Best Scenes From Michael Moore's New Movie". The Daily Beast. September 22, 2009. Retrieved April 29, 2013. ^ Moore, Michael; et al. (2010). Capitalism: A Love Story (DVD). Traverse City, MI: Front Street Productions, LLC. OCLC 443524847. Retrieved July 25, 2015. ^ Vivarelli, Nick (September 1, 2009). "Stars to shine on Lido". Variety. Retrieved September 22, 2009. ^ a b Fritz, Ben (September 24, 2009). "Moore's 'Capitalism' off to profitable start". Los Angeles Times. Retrieved September 24, 2009. ^ "Capitalism: A Love Story (2009) – Daily Box Office Results". Box Office Mojo. Retrieved October 2, 2009. 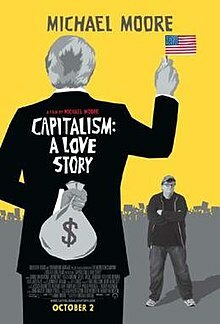 ^ "Capitalism: A Love Story (2009) – Weekend Box Office Results". Box Office Mojo. Retrieved October 2, 2009. ^ "Weekend Box Office Results for October 2–4, 2009". Box Office Mojo. Retrieved October 7, 2009. ^ "Documentary Movies at the Box Office". Box Office Mojo. Retrieved December 26, 2013. ^ "Capitalism: A Love Story (2009)". Rotten Tomatoes. Fandango Media. Retrieved April 10, 2018. ^ "Capitalism: A Love Story Review". Metacritic. CBS Interactive. Retrieved April 10, 2018. ^ Young, Deborah (September 6, 2009). "Capitalism: A Love Story — Film Review". The Hollywood Reporter. Prometheus Global Media. Retrieved September 22, 2009. ^ Felperin, Leslie (September 5, 2009). "Capitalism: A Love Story". Variety. Time. Retrieved September 22, 2009. ^ Ide, Wendy (February 26, 2010). "Capitalism: A Love Story". The Times. Times Newspapers. Retrieved February 27, 2010. ^ a b c Beck, Rachel (September 24, 2009). "Fact-checking Moore's 'Capitalism'". CBS News. Associated Press. Retrieved September 24, 2009. ^ "Capitalism Cut Adrift". Centre for Research on Globalisation. February 17, 2010. Retrieved February 27, 2010. ^ "La Biennale di Venezia - The 66th Festival Collateral Awards". labiennale.org. September 12, 2009. Archived from the original on September 15, 2009. Retrieved September 23, 2009. ^ O'Neil, Tom (July 30, 2009). "Venice Film Festival unveils Golden Lion lineup led by Michael Moore". Los Angeles Times. Retrieved September 23, 2009. ^ "Top Venice award for Israeli film". news.bbc.co.uk. BBC. September 12, 2009. Retrieved September 24, 2009. Michael Moore (October 22, 2009). "Post-Film Action Plan: 15 Things Every American Can Do Right Now". The Huffington Post. Chris McGreal (January 30, 2010). "Capitalism is evil … you have to eliminate it". The Guardian. London. An in-depth review and analysis from the Guardian. This page was last edited on 5 March 2019, at 00:31 (UTC).